Another incredible issue from Geoff Johns and Scott Kolins that really makes you root for the bad guys. Most of Final Crisis: Rogues’ Revenge #2 is taken up by a savage battle between the Rogues and a younger group of “New Rogues” who first appeared in Gotham Underground. The New Rogues have no idea what they’re getting into, and the book shows just how dangerous characters with names like Captain Cold, Heat Wave, and Weather Wizard can be. Meanwhile, Zoom and Inertia get along about as well as you might expect. Which is to say: not very. The timeline is starting to fall into place. The first issue takes place during Final Crisis #2, this one takes place during Final Crisis #3, and the whole of it takes place after the stories currently appearing in the monthly series. The Flash Family meeting in Final Crisis #3 actually continues in this issue, though either scene stands on its own. I’m beginning to wonder just how much this story changed as it became tied into Final Crisis. As originally described, it sounded like the Flash was actually going to be involved. Instead, the whole thing is set when Wally is off on a mission, before Barry really comes back. I did have a problem with the art. Normally I like Scott Kolins’ work, but it seemed a bit too heavy. I don’t remember thinking that with issue #1, but it may simply have not bothered me as much. I also thought the coloring was too muted, but both could be a function of printing. The best moment of last issue was the brief appearance of Iris Allen with lightning and a disembodied voice calling her name. The best moment of this issue was Heat Wave vs. Burn. In Greg Keyes’ Kingdoms of Thorn and Bone quartet of novels, a fencing master explains to his charge that knights don’t fence; they hack at each other with their swords until they find out who has the better armor. That’s what happens here: They blast each other with flame until they find out who has the better insulation. As for that final page, I can’t help but wonder whether Libra is still barking up the wrong tree with his hostage choices. Last I looked, Weather Wizard’s interest in his son was purely scientific. I guess we can assume Iris’ efforts to adopt Josh fell through, given that no one at the family gathering seems concerned about him being missing. The one thing that really rang false for me was the repeated references to Bart as “Kid Flash” at the time of his murder. DC went to a lot of trouble to establish him as the Flash, and every reference to the murder over the past year in Countdown, Salvation Run, etc. referred to him that way. It’s going to be very hard to wait until mid-October for the conclusion to this series! 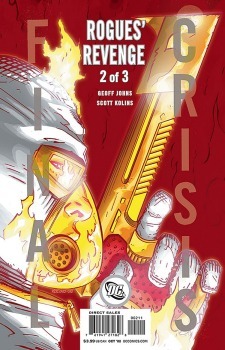 This entry was posted in Reviews and tagged Geoff Johns, Rogues Revenge, Scott Kolins on August 27, 2008 by Kelson. i loved how Libra explains the whole “Flash-is-extremely-important-to-every-Crisis” thing. I love the writing and the art in this book. I like this much better than Final Crisis. This book is probably my favorite comic book of the year. Hands down. I wish this were an ongoing. or at least a longer miniseries. i enjoyed this comic and issue before. i missed how geoff writes the rogues. the art amazed me also. it gave a dark feeling to the comic and the zoom parts were really cool. nice color choices. can’t wait for the next one. :\ haha. Just a wee note: at the beginning WW’s interest in his son was only scientific, but then, after he saw that the baby had his brother’s eyes he went all emo (XD) and his feelings changed a little bit.